It’s sensation stimulation grande central. Vancouver BC’s Granville Island is known as a mecca for creativity: musicians, artisans, clothing designers, pottery- and broom-makers, specialty coffee roasters, and many more. Buskers fill the streets with music. Children skip through the Kids Market. Students at Emily Carr University of Art + Design haul their canvases between classes. And languages from all over the world tumble one over the other as visitors stroll, seek, and get inspired. So where does the savvy visitor go–the spots the locals love? We’ve got the inside scoop. 1. Blue Parrot Coffee. Yes, it might be jammed to the rafters and upstairs seating during the day, but get there after 7 pm, especially on a weeknight, and you’ve got the best spot on the island to enjoy the view of False Creek–sans crowds. 2. Agro Cafe. More than a cuppa regular joe, this cafe offers healthy lunches, breakfasts and even light dinners. Try the red tea latte with a blueberry scone. And the free wi-fi. 4. Go Fish! Don’t let the shack put you off. 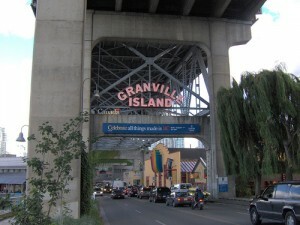 Just west of Granville Island on the edge of Fisherman’s Wharf, this hot spot is a haven for seafood lovers. It’s the spot to stop when you’re craving fish and chips. Try their daily soup, too. 5. Semperviva Yoga Sea Studio. Need some zen? With waterfront views, expansive windows, and expert yoga teachers, Semperviva Yoga’s Sea Studio is the perfect place to take a break and ease your body and your mind. Intrigued? Explore Vancouver BC’s Granville Island and ignite your creative self during Spark Retreat: Re-Ignite Your Creative Self, from Libre Retreats. In partnership with Semperviva Yoga and the Granville Island Hotel, this creativity retreat includes: 6 workshops in Performance Art, Creative Writing and Artful Expression, plus 6 yoga flow classes to help you tap into your creative flow. May 20-23, 2011. Find out more today!